Aster ciliolatus of Michigan Flora. Dry to moist deciduous, mixed, and coniferous forests, especially in clearings and along borders including adjacent roads, trails, and fields; thickets, logged and burned areas, dune ridges, rocky ground. The range of this northern species does not (with barely an exception) appear quite to overlap that of the southern S. cordifolium in Michigan. The long blue to purple rays and large heads will rather easily separate this species from S. urophyllum even if the aspect of the inflorescence is not clear. The heads are 16–28 mm broad when fresh and fully expanded, while in S. cordifolium and S. urophyllum they run less than 18 mm broad. 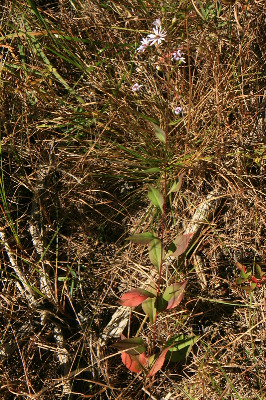 A few plants clearly intermediate with other species are presumably hybrids, e.g., S. ciliolatum × S. lanceolatum from Beaver Island and Cheboygan, Chippewa, and Mackinac Cos., and S. ciliolatum × S. laeve from Schoolcraft Co.
MICHIGAN FLORA ONLINE. A. A. Reznicek, E. G. Voss, & B. S. Walters. February 2011. University of Michigan. Web. April 20, 2019. https://michiganflora.net/species.aspx?id=478.